Having eclipsed the 1,000-win mark in 2015, Spring Arbor University head Coach Sam Riggleman is one of the four-member 2016 ABCA Hall of Fame class. 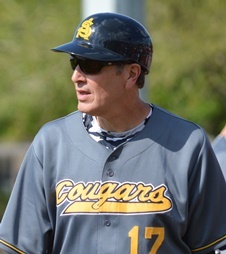 Since 2005, he has led the Cougars to a 358-190 record with five NAIA National Tournament appearances, three regular season conference championships, two conference tournament titles and a runner-up finish in the 2007 NAIA World Series. His career record of 1,004-639-2 has been recorded over nearly four decades at SAU, Dallas Baptist, Bethel College, Southern Illinois and Mount Vernon Nazarene. IP: What does it mean to you to be recognized as a Hall of Famer?